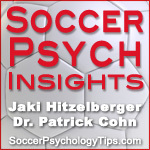 You are here: Home / Soccer Mind Podcast / Do You Try Too Hard To Score Goals in Soccer Games? Do You Try Too Hard To Score Goals in Soccer Games? Dr. Cohn and Jaki Hitzelberger, In previous seasons I would score in almost every match and sometimes more than two goals per match. This season I’ve hardly scored one goal and there is only one month left till the end of the season. At practice I score goals, but when it comes to the game I can’t do it.. Before the game and during I think about one thing: I have to score a goal! After the game I’m disappointed that I didn’t score. In this session we discuss why soccer players who focus too much on trying to score, have a difficult time performing. We know that successful soccer players focus on the process and not on end results, such as scoring or winning. Listen to this episode to learn how to stay confident, composed, and focused in games.